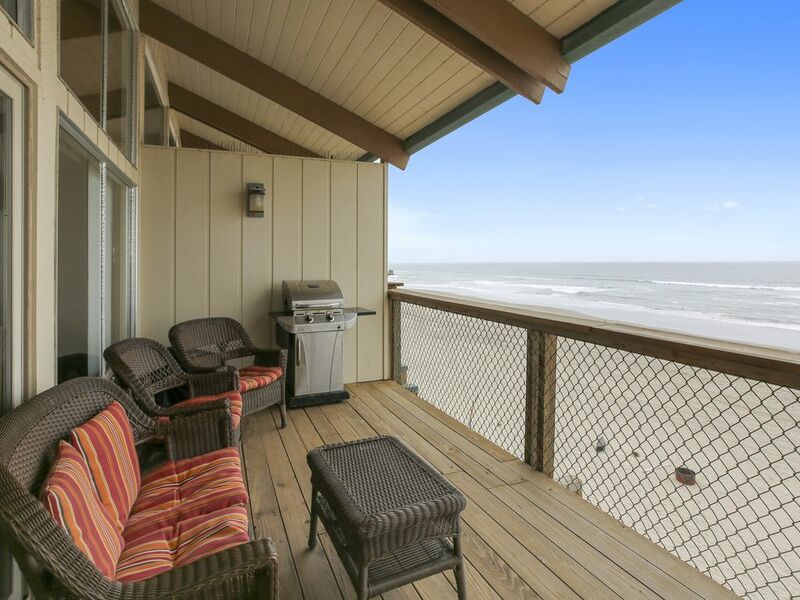 On the Water is an ocean front town home in the gated community of Sand Dollar Beach! Walk into the first level with loft bedroom with 1 Queen Bed and 1 Twin Bed and full bathroom with shower. Go down to your middle level to the living room with TV with cable, dining area seating 6 plus bar stools for additional seating. Middle level you have a balcony deck with patio furniture and gas BBQ with direct feed so no worry about running out of propane. Bottom, third level, you come to the Master bedroom with King Bed and third bedroom with 1 Queen and 1 Twin. Both bedrooms have slider doors opening to a smaller balcony deck with stairs directly to the sand. Hall has laundry room with full washer/dryer and bathroom with tub/shower combo. You are just a short drive to numerous attractions, i.e. Famous Beach Boardwalk, Santa Cruz Wharf, Capitola Village for some shopping & dining, Gizdich Ranch for Berry picking in Watsonville, Moss Landing for some kayaking or whale watching, or Monterey Bay Aquarium and Fisherman's Wharf. Santa Cruz County has great restaurants with the beach feel, from Stagnaro's on the Wharf, Phil's Fish Market in Moss Landing, Cafe Sparrow and Cafe Cruz. Come and enjoy what we have to offer, you definitely will be back! NO SMOKING OR PETS ALLOWED. BED SIZES: 1 KING 2 QUEENS, 2 TWINS. LINENS PROVIDED! Kendall & Potter Property Management, Inc. is a professional property management company doing business in Santa Cruz County for 43 years. We strive to give our customers the professional and individual service they deserve. We have an array of vacation rentals to meet the needs of all of our customers such as large homes for family gatherings, condominiums for a romantic getaway, girl's retreats or business accommodations. We also have fully furnished corporate housing for monthly or short stay rentals. The Santa Cruz area is one of the best kept secrets on the Monterey Peninsula. It offers an array of activities, both recreational and educational. Contact us for more information on our vacation rentals or to book your next vacation in Santa Cruz! We loved being right on the beach and having a bonfire was so cool. Plenty of room and the kitchen had everything we needed. Plenty of towels for everyone.The beach was not crowded and the neighborhood is quiet. The fireplace was cozy for the cool evenings. I could not give 5 stars because the beds and bedding need to be updated. My daughter slept on the queen bed downstairs and said it was very springy, felt like being on a pull-out couch. My niece said the queen bed upstairs was not much better. The pillows in the master were very cheap. The windows were filthy and not just from the recent storm. Very cute house. You can see and hear the ocean from every level and room. The kitchen has all the utensils and kitchenware you might need, and there are enough blankets and pillows to keep everyone comfortable. It was a lovely, relaxing stay! My husband and I were in Monterrey to see family. The condo was perfect to entertain in and very relaxing when they all went home. I have been to La Selva Beach many times over the years. This condo was one of the nicest ones I have stayed in. It had everything we needed. Weather was beautiful with gorgeous sunsets. There were panoramic ocean views from every room. We saw whales and dolphins! Highly recommend it. We are so happy that you and your family enjoyed your stay at 705/On The Water! And look forward to working with you again!